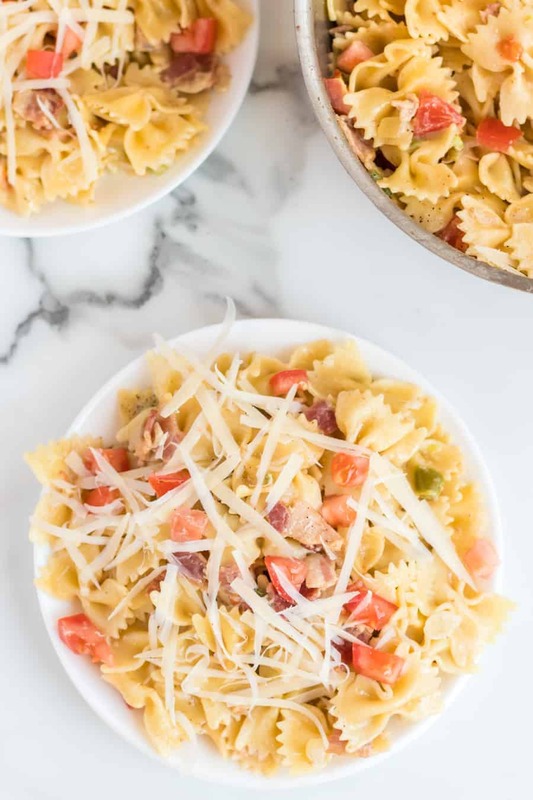 Creamed Pasta with Bacon and Vegetables is one of our all-time favorite easy dinner recipes that comes together in about 40 minutes with just a few pantry staple ingredients. I love bacon. I love it because you get so much flavor for a relatively small amount of money. 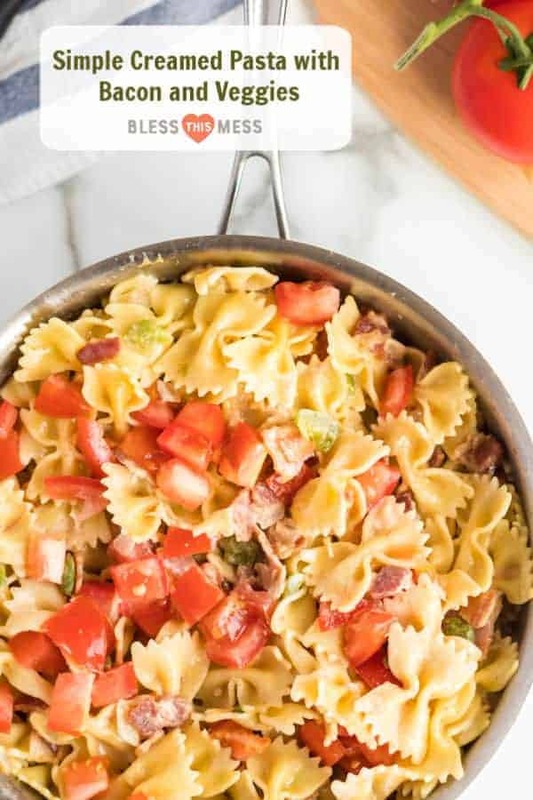 This recipe only uses a half a pound of bacon, a pound of pasta, and just a few veggies, plus a cup of cream. It makes a whole lot of great tasting food on the cheap. That makes this one of my favorite recipes to make for a crowd. The pasta is “creamed” because the sauce is literally just cream. It makes things light and wonderful. You don’t get an Alfredo-type sauce when you only use the cream, but it’ll remind you of it. The vegetables are really able to stand out with the light sauce, but don’t forget the Parmesan on top. It’s not just a garnish and the dish will taste bland without it. The addition of fresh tomatoes is a such a nice, fresh element too. All in all, it’s a few pantry staples come together into one stand-out dish. If you like it really bacon-y, you can use a full pound of bacon. Just remove about half of the grease before adding your onions and peppers. A pound of bacon will produce more grease than you need. This is an easy recipe to scale up or down, and I often make this to feed a crowd. It’s inexpensive and simple and everyone loves it. 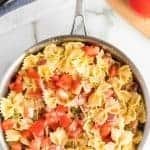 The fresh diced tomato is raw and adds a great texture and flavor to the dish. Be sure it’s ripe so that it adds a subtle sweetness. 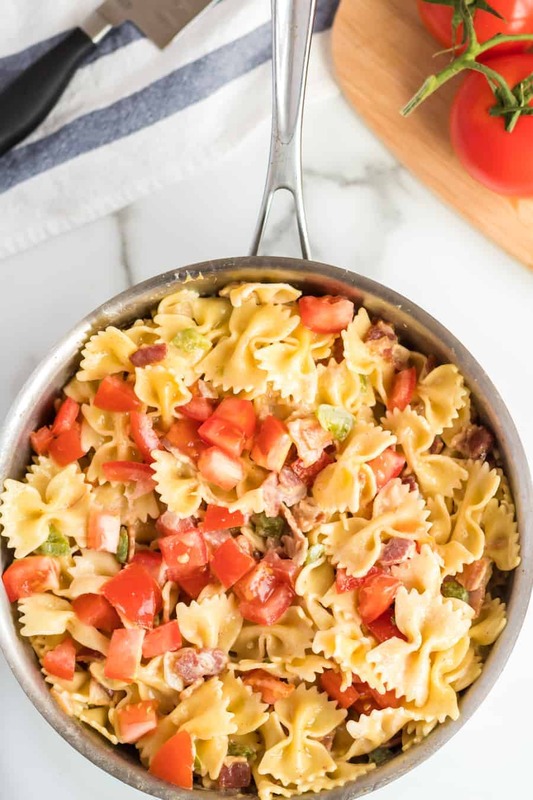 How can I make this pasta with bacon recipe ahead of time? Make the recipe up until adding everything to the cooked pasta. Feel free to refrigerate the sauce portion of the recipe for up to three days. 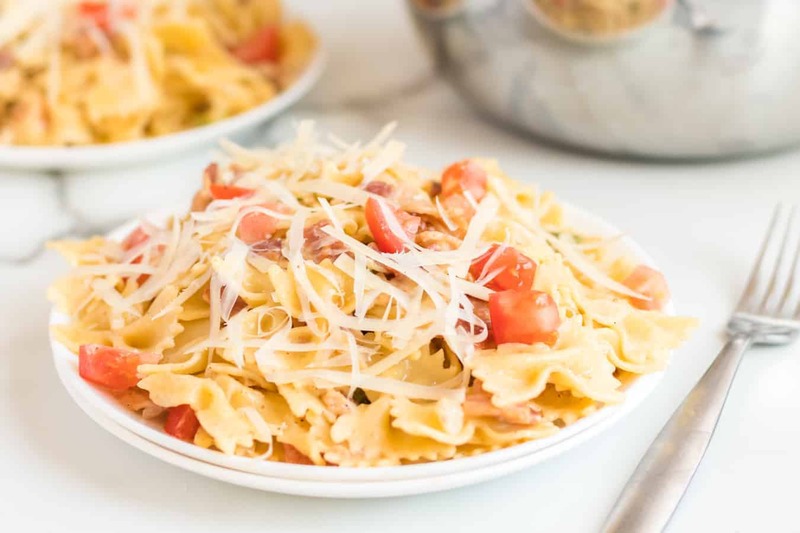 Simply reheat it and add it to fresh-cooked pasta (and then add the tomato and Parmesan) the day you plan to serve it. Finely chop the raw bacon on a cutting board. After bacon is chopped, add it to a large skillet and cook over medium heat until crispy, stirring often. 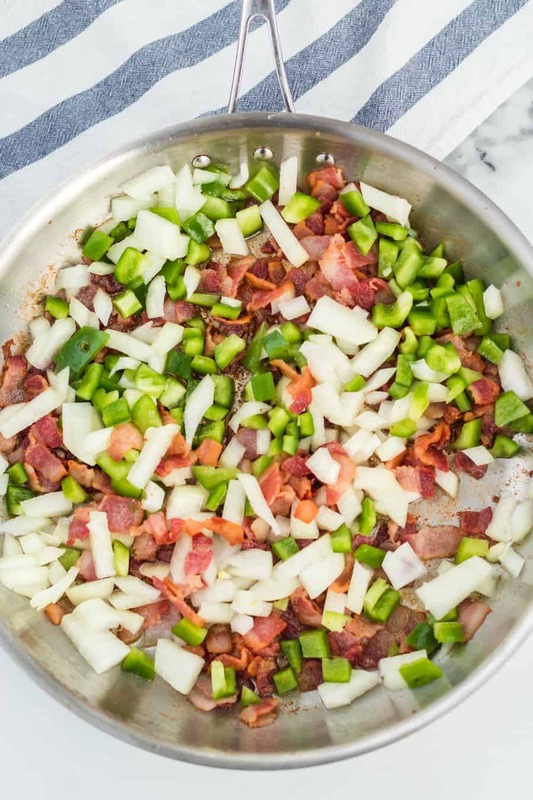 Add the onion and bell pepper to the bacon and bacon grease and cook until soft, 4 to 5 minutes. Whisk in the cream, scraping up any browned bits on the bottom of the pan. Add the salt and combine. Let the mixture simmer for 10 minutes. Add the hot cream mixture to the hot cooked noodles. Add the diced tomatoes to the noodles. Serve right away with the Parmesan on top. So much to love about this post. It’s one of my favorite recipes, and I can’t wait for you to try it.